T.J. Dixon & James Nelson have enjoyed a 25-year career as award-winning, large scale figurative sculptors in stone, bronze and terracotta. 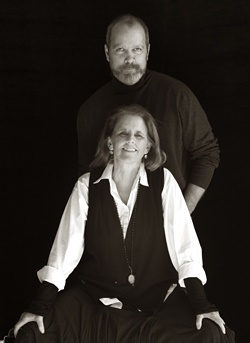 Since 1991 they have been working together as public artists for clients including cities, universities and hospitals. Their projects often include collaborative design with landscape architects, architects and other design professionals. Many of their award-winning projects have not only achieved public acclaim, but have added a unique, distinctive sense of place to many institutions and communities. Since 2001 Dixon & Nelson have directed the sculptor’s eye and sensibility to a series of photographic work. As part of a collaborative project called “The Real Women Project,” they used both sculpture and photography to document the beauty in every woman regardless of age, body type or ethnicity. Over a period of five years they photographed and sculpted hundreds of women from across the country. Collections of these portraits of women are on permanent display in women’s clinics across the United States, including the American College of Obstetricians and Gynecologists in Washington, D.C.
That groundbreaking photographic series was followed by “The Shape of Light,” an aesthetic photographic essay that explores how pure, natural light sweeps and falls over simple elemental form and relates to the couples ongoing fascination with shape and light. This collection of photographs includes nudes, drapery studies and still-lives. As a general theme in their photographic work, they have been always interested in bringing to light the unseen or overlooked beauty in our world, whether it is in the face of an 80 year old, African American woman or the ethereal glow of natural light on an eggshell. In 2010 they turned their camera on the world of close friends, Manuel and Narcisa and their children, a family living very much in the shadows of American society. Over a period of years they have followed the family through photography and interviews. The resulting photographic essay portrays the struggles, the fears and the dreams of this family and puts a compelling face on the struggle of millions. Dixon and Nelson hope through their work to help lessen the fears that our society has of these struggling families and to bring a better understanding and acceptance, not only of this family, but all immigrant populations.